I finally published all the tree bark patterns in an ebook as well as individually. 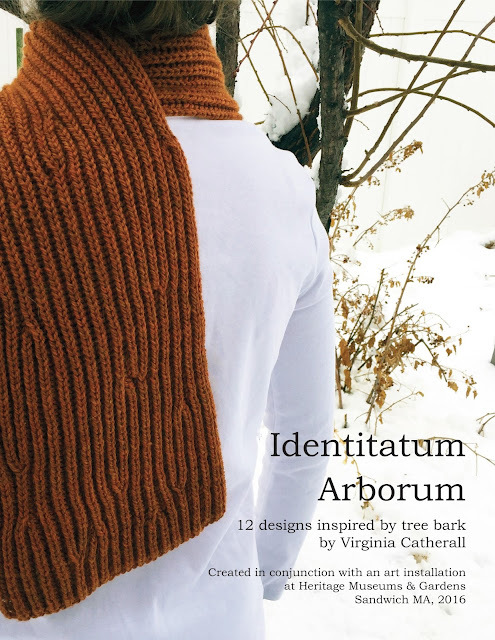 You can see them all under the identitatum•arborum patterns tab at the top of the page. You can purchase them from Ravelry here. And as I have said before, I am hoping to have a real-world booklet soon with the patterns, too. It has been an amazing project but I am so ready to move on to thinking about the Great Basin National Park artist-in-residency this fall! We went to Heritage today and I was incredibly taken by your artwork! I couldn't get the tree bark knitting out of my mind, and am so thrilled to see the patterns! Thank you for sharing your vision and talent with us here on the East Coast. Wow, you are the first person to let me know they have seen it! Living in Salt Lake, not many people I know have been to Massachusetts yet. I am glad you liked it! I had a great time designing the knitted pieces and making the artwork.